Please check the configuration. ". The adapter failed to transmit message going to send port "DCSendLimaPurchaseOrder_FTP" with URL "<servername>:21/uat/GO_PO_XML/inbound/pending/File_To_Lima_%datetime_bts2000%.xml". It will be retransmitted after the retry interval specified for this Send Port. Details:"Invalid URI: The URI scheme is not valid.". Building a new BizTalk 2013r2 VM for the first time today and I ran into a problem that I guess may hit a few people. 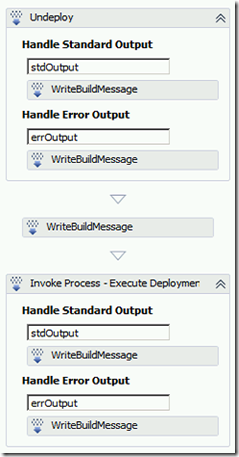 When I started the ESB Configuration tool I received the message "Object reference not set to instance of an object". It turns out the tool relies on some on some of the IIS6 management tools. Once I'd added these from Server Manager I restarted the config tool and it worked ok. Starting new year's resolution early - two blog posts in one day! I updated the BizTalk config to trace the received WCF message. It looked ok, had expected namespace and root node. Problem was, I'd forgotten to set the receive pipeline of the physical two way send port to XML Receive - it was sat at PassThruReceive. This meant that the message type wasn't getting promoted. Because the receive on my orchestration's logical solicit response port was strongly typed - it threw the exception. Had a funny problem with BizTalk today that I thought worth blogging about in case anyone else makes the same mistake. After deploying with the BizTalk Deployment Framework I kicked off an integration test which dropped a single record flat file in the receive location. The send port did its thing and all looked good. Then I noticed many (and I mean many!) messages were being sent. My first thought was perhaps the source file wasn't being deleted by the file adapter but that drew a blank. It turned out the problem was caused by a simple mistake with the orchestration's logical activating receive port. I had set the Binding to Direct! So, canonical message entered the orchestration but also left the orchestration (because I have mapping on the send port rather than within the orchestration). This meant that the send (from the orchestration to the messagebox) triggered a new activating receive and another orchestration instance! I’ve been working with BizTalk since 2006r1 (the one without the handy WCF adapters). Since that time I’ve tried various community offerings to improve the deployment process. In 2008 I was working for a large retailer. In order to support parallel development for phased but overlapping releases (config management fun! ), they had up to four different BizTalk groups each containing between two and four servers. At the time, we had approximately eighteen different BizTalk applications of varying complexity, running on each BizTalk group. As you can imagine, this made management of the binding file time consuming and difficult. I turned to Michael Stephenson’s BizTalk Configuration Management tool on CodePlex (http://configsettingstool.codeplex.com/) this was a great help since it allowed us to maintain all the settings for the bindings in a single SQL Server database. 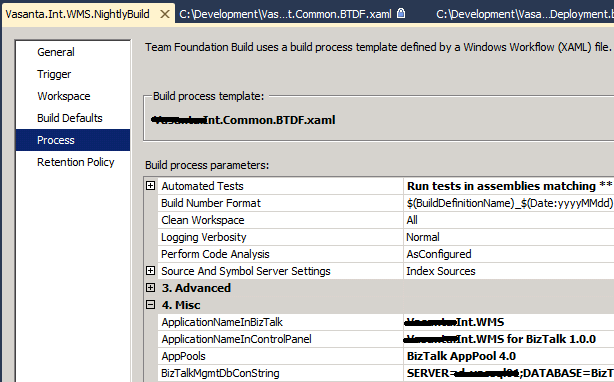 Last year I joined a BizTalk development team where they were already using the BizTalk Deployment Framework (BTDF)(http://biztalkdeployment.codeplex.com/) along with BizTalk 2010 and TFS 2010. I was really pleased because I’d heard a lot about the BTDF but hadn’t previously found the time to work with it. Working with the deployment framework can be quite daunting initially because it provides so much functionality. Fortunately the existing team members we able to quickly answer my questions. It was at this time “I had a dream!”. Wouldn’t it be great if a check-in of source code triggered a build, automated deployment and test of our BizTalk applications. 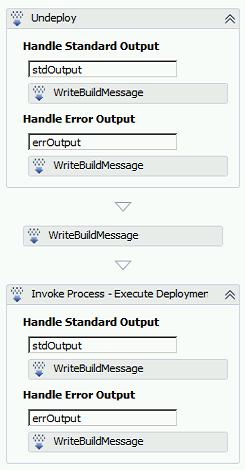 Of course, this is not a very original dream and Continuous Integration for non-BizTalk applications is very common. Just to make the task more challenging, I wanted to keep the Build Server free of BizTalk and instead deploy to a remote two-node BizTalk server group (known as our “dev” group). If I could get this this to work then it should be easy to adapt so that the BizTalk application could be deployed to other environments higher up the food chain, namely “test”, “pre-prod” and, dare I say it; “prod”. 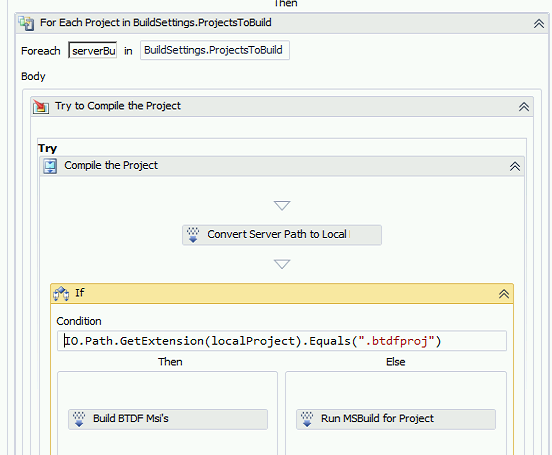 The btdfproj file has an item group describing the location path for the binaries of the solution’s: Schemas, Components, Pipelines, Pipeline Components, Orchestrations and Transforms. 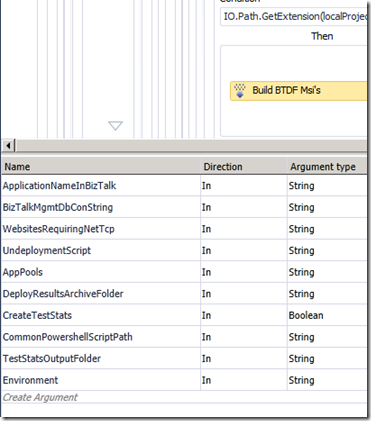 We need to configure these item groups to select from the TFS build structure where a TFS build is being used. 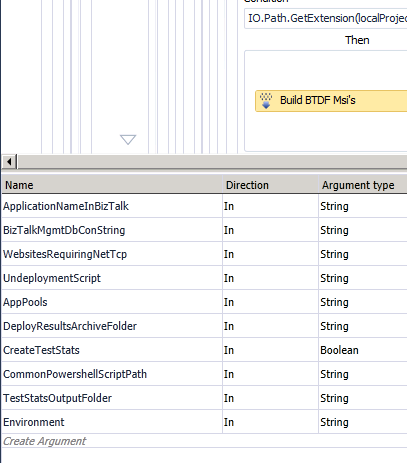 Note how this overriding group will only be used if the “TeamBuild” variable is true, explained in the TFS section. For the BizTalk deployment framework to create Virtual Directories, it expects to find them in the folder $(RedistDir)\ProjectName\bin. With a TFS build, components of the virtual directory (e.g. .svc, .dll etc.) won’t be in the correct place. Solutions are built by TFS using what are know as build definitions. One critical item from the above page that must be set is the “Items to build”. When not using BTDF this would typically point include the project files for any dependent projects, then the .sln of the BizTalk solution to be built. However, for any automated BTDF build, the .btdfproj file must be appended to the list of projects / solutions that need to be built. 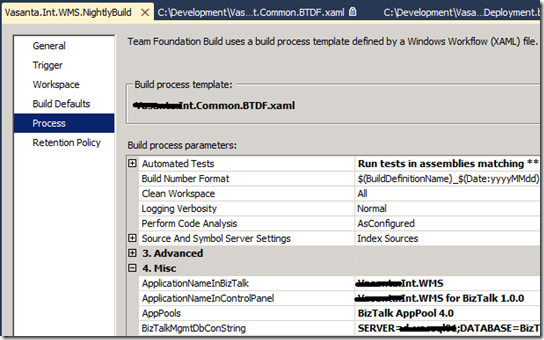 From the previous screen grab, notice the pane labelled “Build process template”. This points to a .xaml windows workflow file which I have adapted from a standard build template. As described in the previous section, toward the end of the xaml build execution Powershell is called to undeploy then deploy the BizTalk application. 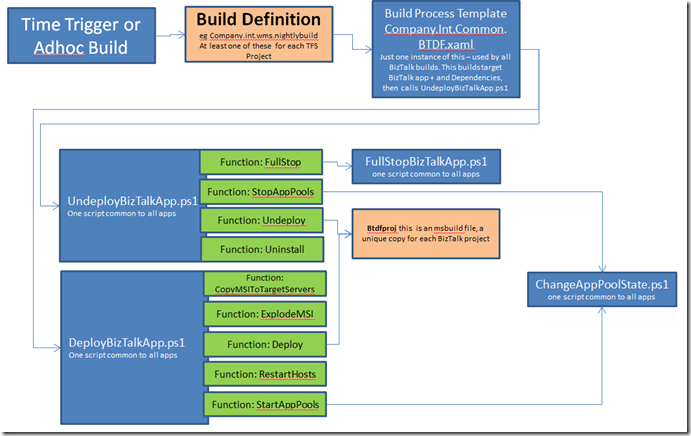 The two main Powershell scripts (UndeployBizTalkApp.ps1 and DeployBizTalkApp.ps1) will be started from the build server. However, they must execute script on the target BizTalk servers. In order to support this, the Build server must be configured as a Powershell Client and granted permission to pass credentials to the BizTalk servers. 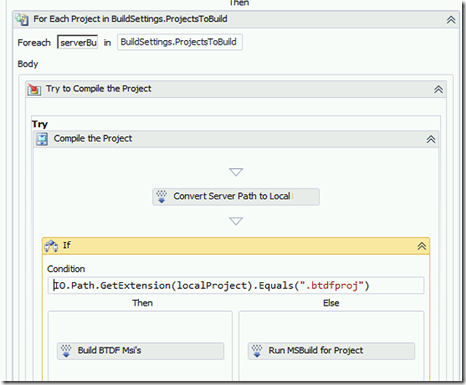 The initial request to Powershell will be made by the TFS Build Service. The credentials of this service will be passed to the BizTalk server. It’s important that the account used for the TFS Build service has is a member of the BizTalk administrators group. On the build server, update Group Policy to allow your credentials to be delegated to the remote server. Open gpedit.msc and browse to Computer Configuration > Administrative Templates > System > Credentials Delegation. Double-click "Allow delegating fresh credentials with NTLM-only Server Authentication". When running the TFS build you may receive errors reporting that the schema cs files used for unit test (eg modified_OP-Order-v1.xsd.cs) could not be found. Tom Abrahams (http://www.tfabraham.com/blog/) for his amazing effort in taking the BTDF to where it is today. All those who think Tom deserves a Connected Systems MVP – have a word with Microsoft! I came across (thanks Paul) a great way to quickly generate test data for SQL Server today. I've been working with XML for several years now but I've never been entirely sure that I fully understand all there is to know about namespaces. Of course namespaces are central to how document instances are defined by BizTalk, so I certainly had some understanding. However, it's quite easy to just "get by" without a complete understanding because of the inteli-sense and other helpful features provided by tools like Visual Studio and XML Spy. If I'd had only notepad in which to create the XSDs and XML documents then I'm sure I would have been stuck. Anyhow, this has been bothering me for a while, so today I decided I was going to learn all there is to know about XML namespaces - and make it stick! This learning involved reading sections from the excellent book "The XML Schema Companion" by Neil Bradley, and otherwise messing around with XSDs and XML documents in Visual Studio. Note, the root node has the attribute "xmlns:xsi", this is simply defining a prefix for a namespace - it is not setting the document level namespace. In effect it is saying that elements, attributes etc from the namespace http://www.w3.org/2001/XMLSchema-instance can be used by prefixing XSI, however where there is no prefix then the element, attribute etc does not belong to a namespace - it is unqualified. The attribute noNamespaceSchemaLocation is interesting. This gives the URL reference to the XSD that will be used when validating the XML document. It also infers that the XSD does not define a namespace - and that this document is not "namespace qualified" at document level. The attribute xmlns has been added to the root node and assigned the value "http://samplenamespace". This specifies that, unless explicitly qualified with a different namespace, all elements and attributes defined with the XML instance belong to the namespace "http://samplenamespace"
The above just skims the surface of what can be done with namespaces but in does provide the basics. There are many cases where an XML document will contain items defined in multiple namespaces. However, understanding such a document is straight-forward once you are aware of the key concepts and implementation as described above. Update: 4th April 2012, had some more fun with XSDs today. Must remember, adding xmlns="x" to an XSD sets the namespace for that XSD; setting targetNamespace for an XSD gives the namespace for which other XSDs and XML can reference with an Import. While creating the new schemas I came across a problem when trying to validate what seemed to be valid XML. Under the root element was <Invoice> , on attempting a validate from within XML Spy I received the message: "Unexpected element 'Invoice' in element 'InvoiceBatch'. Expected: Invoice". It turned out that this was because I had removed "elementFormDefault='qualified'", once I added this back in then it validated OK.
We have a test team in India that I would like to run some load and performance testing. They have access to the required test server and load tools but limited experience using tools such as perfmon. I have previously only used Perfmon to take a real-time view of performance counters, or used the ui to configure logging to a data file for later evaluation. In this particular case I didn't have access to the test server to enable me to manually configure the logging, and I know that trying to walk someone through this on the phone would be painful. After a little searching the web I discovered that it's possible to script the perfmon counter logging - exactly what I needed! logman create counter BASELINE -f bincirc -max 200 -si 00:00:05 --v -o "c:\perfmon\serverbaseline" -cf "c:\perfmon\baseline.config"
Counters to include in the log are contained within the previously mentioned configuration file: "c:\perfmon\baseline.config"
On first running the batch file locally (to test it) I received a message telling me that the data capture vehicle couldn't be created because of a permissions issue. I adjusted the permissions to the logging folder "c:\perfmon\serverbaseline" and all was good. A few minutes after starting the logging I could see the log file beginning to grow. Great, I thought! I went back to the perfmon ui, clicked the 'view log data' button (looks like a db drum) and selected my new and continually growing log file. It didn't complain, and the current data view was cleared - but where was the historic data that should be been logged? I opened the log file in notepad - just binary data. I wanted to check that it was logging the data I expected so I deleted the BASELINE data collector, then re-created, choosing to log to text file, rather than binary. I then started logging, gave it a few minutes and opened the newly logged data in notepad. It appeared just as I expected, with column headers for my counters and lots of data for each subsequent row. Great - I was logging the data but couldn't get it to appear in the perfmon graph! Then it struck me, in addition to choosing the data file as the data source for the perfmon graph I needed to add the counters to the graph. I hit the add button on the toolbar (+ symbol) and was presented with a dialog offering a limited set of counters - just the ones I'd specified in the baseline.cfg file. After selecting the counters, my historic data was displayed in the graph. Such a result called for celebratory cup of tea! I've now also started working on a script to run a SQL profiler trace. My initial results were disappointing, the trace file was generated but my filters were not applied. I encountered a problem a few days ago with files not being picked from a receive location. The configuration was very simple, a two node group with a file receive location pointing at a share on a windows 2003 server in a different domain. The volume of files being dropped for collection by BizTalk wasn't high - about ten per minute. The behaviour was; files collected very slowly - say one file every five minutes. If I re-started the host instance then all the remaining files would be collected very quickly but ten minutes later it would be back to slow mode. It is quite simple to identify if throttling is being applied. Run perfmon on the BizTalk box and add counters for "BizTalk:Message Agent - Message publishing throttling state" (publish to msgbox) and "Message delivery throttling state" (delivery to endpoint) . Ensure that you select the host instance hosting your receive port. A flag indicating whether the system is throttling message delivery (affecting XLANG message processing and outbound transports). After configuring perfmon I could see that I had a counter value of 6 for the publish state - the receive host was being throttled due to database growth. I needed to take a look at the MsgBox! http://blogs.technet.com/jpierauc/pages/msgboxviewer.aspx. After running the MsgBox viewer I was presented with a report which re-enforced the case that the BizTalk was running low on DB space. On checking the MsgBox db through SQL workbench I could see that it was just over 4gb in size and had 0 mb available! The db was set to autogrow and the disk hosting the db had plenty available space to grow. The problem was the rate at which the db would grow. This can be checked by right-clicking the db from the SQLWB object explorer selecting properties \ files. Both the data and log was set to grow by 1mb. This value is set based on the value of the model database at the time that the BizTalk databases are created. One to remember for the future - ensure the growth is set to a more reasonable chunk -10% would be good. I'm currently preparing to deliver Microsoft Course 2934A - Deploying and Managing Business Process and Integration Solutions Using Microsoft BizTalk Server 2006. So far, I've been impressed with the content, it's well structured and I think the topic selection has been good. After registering the dll, load windows explorer and double-click my computer. In the Other section, you'll see system folder called 'BizTalk Server Assemblies'. Open this up and you'll see all of the BizTalk assemblies which have been deployed to the local GAC. From here, you're able to drill into each assembly to display an entry for each artefact that it conatins. At the next level down you can double click the artefact to view the XML behind each schema, map or orchestration - nice!